Jai Sen shares a traditional family recipe for Bengali Shrimp Curry, an Indian dish his Mother taught him. Jai Sen's Mom is from Upstate New York and his Father from India and after they met and fell in love, they moved to India. The rest of Jai Sen's story is a delicious history. 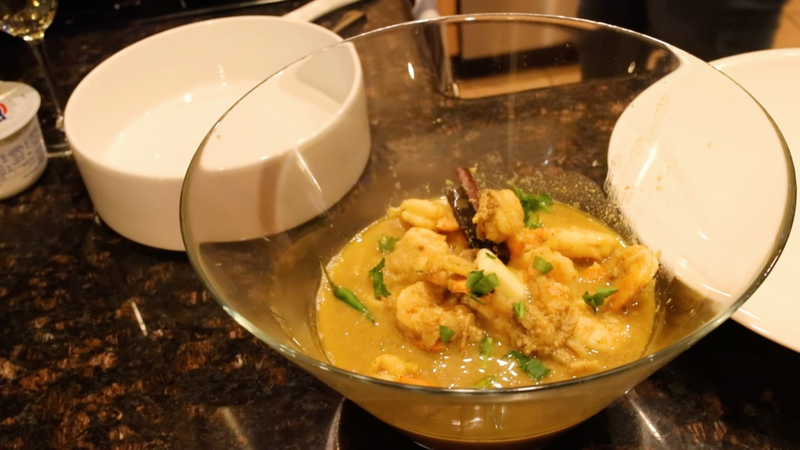 WATCH JAI SEN MAKE THIS BENGALI SHRIMP CURRY ON REAL FOOD REAL KITCHENS ON AMAZON PRIME! The final dish - Bengali Shrimp Curry. This recipe has a long history in my family. It’s part of a group of curries from Bengal in northeast India that combine seafood with a coconut and yogurt-based curry. Unlike curries from elsewhere in India, it’s not spicy and is very delicate. Its Bengali name hints at its southeast Asian influence. It’s generally not considered anything too special, but it’s taken on a new life as it’s been passed down from mother to daughter/daughter in law. Each person put her particular stamp on it. It’s one of the recipes my (American-born) mother learned from her mother in law, and I loved it so much that I requested it for every birthday growing up, even after my family had left India. Some of my mother’s innovations are because she had to find ways to recreate the dish with different ingredients after we left India, so this version is uniquely hers. One day I’ll have mastered it enough to modify some aspect of it myself, and then I’ll pass it along to someone. Prep ingredients and spice paste: slice the onions; julienne the ginger; peel, devein, and rinse the shrimp in cold water and pat dry. Make a paste out of the cumin, coriander powder, and turmeric and 1 tbsp of water (or more, if you need—the paste should be liquid, not clumpy or dry, but not too wet either). Chop the parsley for the garnish. Heat oil in a large pot over medium-high heat. Once the oil is shimmering, reduce heat to medium and add bay leaves, cinnamon sticks, and cloves, and sauté very gently for 1-2 min., until bay leaves get darker (but not brown) and the whole spices become fragrant. Reduce heat slightly. Add the spice paste and stir gently, coating the whole spices. Fry the spices until they are fragrant (see recipe tips). Add onions and lightly sauté until transparent, about 3-5 min. Make sure the heat is not high enough to caramelize the onions; reduce it if the onions cook too quickly or if you get a fried onion smell. Add sugar and stir gently until the sugar dissolves and has thoroughly coated the onions. The onion/spice mixture will look brown at this stage. Add ginger and sauté gently until fragrant, 1-2 min., making sure not to brown the ginger. Gradually add the Greek yogurt, stirring it in as you add it, to fully incorporate the onions and spices. Stir in the Thai coconut milk (carefully, as it tends to partly solidify and come out of the can all at once). You can add another sprinkle of turmeric at this stage to further enhance the bright yellow color this curry is known for. Reduce heat slightly again (medium-low) and bring the curry to a simmer, stirring occasionally. Add the shrimp and stir until the shrimp turn pink and become opaque, about 5 min. The trick to avoiding them getting rubbery is to let them cook very slowly. Add the cardamom powder. You can serve the curry once the shrimp are fully cooked (so within about 10-15 min. ), but ideally you’ll let it simmer on very low heat for at least an hour. If simmering for more than 15 min., cover the pot to avoid the curry getting too thick. You can add water, 1 tbsp at a time, to thin it out if it gets too thick during the simmering process. When ready to serve, slit 3-5 Thai chilies lengthwise, trim off the stem, and stir gently into the curry. You can skip this step if you don’t want the curry to have too much heat. You should leave the whole spices in the curry, because this is one of those dishes that is extraordinarily good the next day, and you want the cinnamon, cloves, and bay leaves to stay in the curry to keep flavoring it overnight. As a final step, add 1 tsp. of salted butter and stir it into the curry, and taste and add up to ¼ tsp salt if needed. Garnish with the chopped parsley and serve with Basmati rice. *The way the onions, ginger, and chilies are cut is very specific. For the onions, peel the onion, trim the ends, and cut in half. Then chop so that you get half-rings. This gives you the right combination of thickness and surface area to cook the onions well without caramelizing them. Medium onions will work best. For the ginger, peel the ginger and trim it into a cube. Then slice it along the grain to create thin little julienne pieces that are about ½" long. This increases the surface area and is said to release the most potent essence of the ginger gradually as the curry simmers. For the chilies, slice them lengthwise but don’t split them, because you don’t want the seeds coming out and getting into the curry (which would make it too hot). You want them to release some heat and add a fresh taste at the last stage. *This recipe involves cooking everything very gently: nothing should caramelize, burn, or cook too quickly. When in doubt, take more time with lower heat and cook more slowly. *When initially cooking the spices and onions, watch very carefully and pay attention to the aroma as they cook. You’re ready to move on to the next step as soon as the spices or spice paste lose a raw smell and just begin to become fragrant. *Adding the sugar just after the onions have become translucent helps to cut any bitterness for the onions, one of the tricks (like adding the small amount of cardamom at the end) that gives this dish a very delicate, refined flavor. *You can substitute tofu for shrimp if you’d like. Cut extra firm tofu into ¼" thick pieces and sauté in a separate pan (like a skillet) in 1 tbsp canola or peanut oil, until the tofu is crisp and a little browned on the outside so that it’s tough enough not to dissolve during simmering. Drain on a paper towel and set aside until it’s time to add it to the curry. *Conventional wisdom states that wine and curry don’t go together. Don’t believe it! A delicate curry like this works great with a dry white wine (dry Rieslings and Chardonnays go very well with the sweetness of this type of curry, as do full-bodied sparkling wines). Posted on October 30, 2017 by Craig Chapman and filed under Indian and tagged Indian Food real food real kitchens Real Food Curry Shrimp Bengali Brooklyn Gowanus Park Slope Recipe Recipes Family Recipe Culture History Indian Food.